Mogadishu: Former Somali president Abdullahi Yousuf Ahmad, a veteran politician, warlord and strongman, has died aged 77 after years of ill health, state radio said Friday. "The late president will be remembered for his strong stand against religious extremists," the government radio in Somalia's war-torn capital Mogadishu said. Yusuf "passed away in the United Arab Emirates", it said. His death was confirmed by family members. In a political career spanning almost half a century, Yousuf survived several assassination attempts, two stints in jail and a liver transplant. 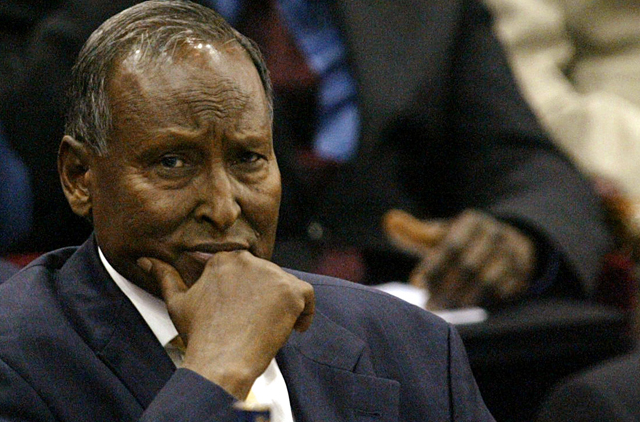 Often described as authoritarian, Yousuf was perceived as the strongman Somalia needed to end years of chaos when he was elected in 2004, after two years of internationally-sponsored negotiations. But in 2006, the Islamic Courts Union (ICU) defeated government forces to grab control of most of the Horn of Africa country, imposing a strict form of Sharia law. Ethiopia, Washington's main regional ally, then sent troops to oust the ICU but became bogged down in a bruising guerrilla war with hardline militia. Yousuf's unwavering support for Ethiopia's military occupation isolated him in Somalia, and he resigned from the presidency in 2008, moving to Yemen and the UAE to live. Websites supporting the Al Qaida allied Shebab insurgents - battling the current Western-backed government in Mogadishu - described Yousuf Friday as a "warlord that had served the interest of non-Muslims, especially Ethiopia." When the northern Somali region of Puntland declared its autonomy in 1998, Yousuf also became its president. Born in the Mudugh region of Puntland on December 15, 1934, Yousuf studied law at the Somali National University, and trained as an army officer in the Soviet Union and Italy.